Minnie Says: Creamed leeks may not exactly be something new in French cooking, but leeks in general were new to us until a few months ago. Hubby and I now love them almost anyway at any time…so when I saw this Creamed Leeks recipe on SouthernMomCooks.com, I just had to try to make it a bit more in line with our healthier eating plan. 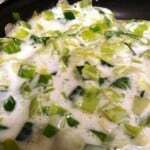 This dish is very simple: Sliced leeks are sautéed down in a little bit of margarine until they are soft and sweet. 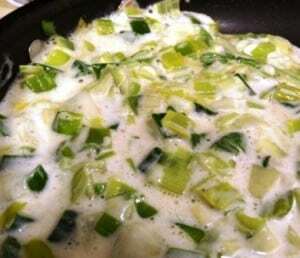 Add in a simple cottage cheese and nonfat dry milk mixture (instead of the heavy cream), which also binds the leeks together and has that very same savory-sweetness as the leeks themselves. Grate in some fresh Parmesan, which still adds that punch of salt to wake it all up. And it’s ready to serve. This simple but decadent dish goes perfectly with nearly everything—under fish, beside seared chicken breasts, or even alongside sliced steak. In a nonstick sauté pan, melt the margarine over medium heat. Add the leeks and water, season with salt and pepper, cover, and reduce heat to low, cooking until the leeks are soft—about 10 minutes. Blend cottage cheese and dry milk in blender or food processor until smooth. Pour into pan with leeks and cook until heated through. Add Parmesan as desired and serve. This simple but decadent dish goes perfectly with nearly everything—under fish, beside seared chicken breasts, or even alongside sliced steak. We are eating ours with Tilapia fillets tonight. Yummy!